Stress is a part of modern life. A little stress can be helpful—it can keep you alert and engaged with life. But chronic stress can be dangerous to your health by increasing risk of disease, as well as altering thoughts and behavior. Seventy-five to 90% of all doctor’s visits are stress related. 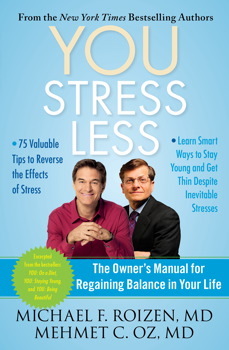 Check out these books to learn how to manage and reduce stress. We may not be able to control what life throws at us, but we can always control our response to it. 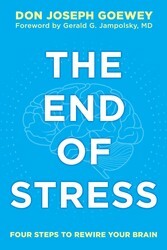 The Upside of Stress is the first book to bring together cutting-edge discoveries on the correlation between resilience—the human capacity for stress-related growth—and mind-set, the power of beliefs to shape reality.McGonigal combines science, stories, and exercises into an engaging and practical book that is both entertaining and life-changing. The Upside of Stress is not a guide to getting rid of stress, but a guide to getting better at stress, by understanding it, embracing it, and using it. Stress is America’s #1 killer, aging people prematurely and compromising people’s health enormously. Culled from the pages of bestselling YOU: Staying Young, YOU: On a Diet, and YOU: Being Beautiful, this handy pocket guide that offers ninety-nine incredibly valuable tips to reverse the effects of stress is a must read. Stress is responsible for many of today's diseases and illnesses. Stress and anxiety compromises your immune system and your body's ability to absorb the nutrients from your food. But is stress relief enough to prevent Illness and disease invading your body or do we need to change our way of thinking and being in order to learn how to deal with stress before it starts? Stress relief is far more difficult to achieve when you are suffering from chronic stress. It is also time maybe to reassess your life, and discover what is really causing you to be stressed. Through the author's journey, you will learn not only how to achieve stress relief but how to deal with stress by gradually eliminating it from your life. Stress debilitates and even damages the brain, inhibiting you from living life to the fullest. From your career to your family to your golf score, everything depends on higher brain networks functioning at optimum. That’s why alleviating stress is the key to success—and why changing your brain is the first step to sustaining more joy, peace, and fulfillment at every level of life. In The End of Stress, Don Joseph Goewey offers an easy, four-step method that will increase your brainpower and end anxiety. Drawing on the latest research in neuroscience and neuroplasticity, Goewey’s cutting-edge approach has been tested through webinars and seminars in high-stress environments and proven effective from chief executives, managers, and engineers to blue-collar construction workers. You have the power to reach your highest potential—but it all starts with the brain. The End of Stress gives you the tools you need to transcend stress and make every day your best day. Most stress is created by how we think about things. From Stress to Stillness will help you to examine what you're thinking and change your relationship to your thoughts so that they no longer result in stress. Drawing from the wisdom traditions, mindfulness meditation, psychology, New Thought, and the author's own experience as a spiritual teacher and counselor, From Stress to Stillness offers many practices and suggestions that will lead to greater peace and equanimity, even in a busy and stress-filled world. Meditation is a great way to manage stress. Poet-philosopher and Zen Priest Tai Sheridan's Buddha in Blue Jeans is an extremely short, simple and straight forward universal guide to the practice of sitting quietly and being yourself, which is the same as being Buddha. Sitting quietly can teach many ways to accept life, meet pain, age gracefully, and die without regret. The book encourages sitting quietly every day. There always seems to be plenty to worry about, and worry we do—from nagging concerns to full-blown anxiety. It’s time to stop worrying and instead create a more peaceful, powerful, and purposeful life. 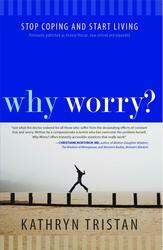 Kathryn Tristan’s hands-on, solution-oriented book empowers you to break free from constant fear, worry, and anxiety. She shows how to eliminate automatic doomsday thinking and take back control of your own life. This no-nonsense approach draws from a variety of disciplines to offer a comprehensive guide for rewiring your brain that includes restructuring how you think, easy relaxation exercises, simple lifestyle changes, and transformative spiritual practices. 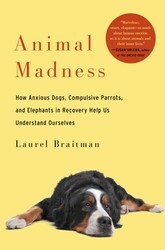 Through personal anecdotes and inspiring true stories, including self-assessment quizzes and the latest science, you’ll discover the secrets to a worry-free existence, including how to: • recognize and eliminate inner trash talk and negative thinking; • create outlook makeovers to slash stress and worry; • master sure-fire worry busters; • and discover calm during chaos. Stress and pain are nearly unavoidable in our daily lives; they are part of the human condition. This stress can often leave us feeling irritable, tense, overwhelmed, and burned-out. The key to maintaining balance is responding to stress not with frustration and self-criticism, but with mindful, nonjudgmental awareness of our bodies and minds. As you work through A Mindfulness-Based Stress Reduction Workbook, you'll learn how to replace stress-promoting habits with mindful ones—a skill that will last a lifetime.This groundbreaking, proven-effective program will help you relieve the symptoms of stress and identify its causes so that you can start living a healthier, happier life. Reduce stress through living with intention. Right now, you wake up tired. Your to-do list is too long. The commitments―and the laundry―are piling up, but your energy keeps dwindling. You feel like you're simply making it through the days, not living or enjoying any part of them. In Say Goodbye to Survival Mode, you'll find both practical ideas and big-picture perspective that will inspire you to live life on purpose. As a wife, mother of three, and founder of the wildly successful blog MoneySavingMom.com, Crystal Paine has walked the road from barely surviving to living with intention.